Russia blocks a UN Security Council statement condemning the Syrian government's increasing military offensive on the city of Aleppo. In what has become routine since the start of the Syrian civil war, Russia on Thursday night once again blocked a UN Security Council statement on Syria. This time, the U.S.-drafted resolution condemned the Syrian government's increasing military offensive on the city of Aleppo, according to AFP. The move heightened diplomatic tensions ahead of a key Russia-U.S.-UN meeting in Geneva on Friday on organizing an international Syria peace conference. Russian diplomats refused to allow any mention in the statement of President Bashar Al-Assad's tactics, diplomats said. 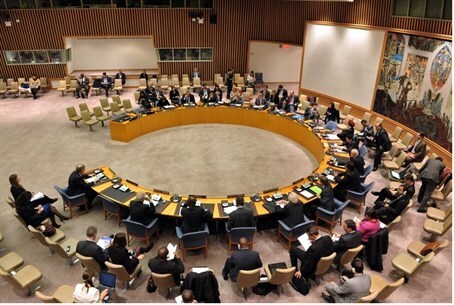 In the face of the obstacles, the United States decided to withdraw the draft which needs the approval of all 15 Security Council members to be released. A spokesman said that Washington was "very disappointed" at the Russian blocking. The United States wanted the statement to express "outrage at the use of air strikes by the Syrian government, in particular the use of heavy indiscriminate weapons, including Scud missiles and 'barrel bombs,' which were dropped on Aleppo" this week. The Doctors Without Borders group says at least 189 people have been killed and nearly 900 wounded in the Aleppo bombings since Sunday. The statement would have expressed concern at the general "escalating level of violence in the Syrian conflict and condemned all violence by all parties," reported AFP. Russia, a close ally of Assad’s, has used its power as a permanent member of the Security Council to veto at least three western proposed resolutions which sought to increase pressure on the Syrian leader. Russia supplies Assad with ground-to-surface interceptor missiles as well as warplanes and helicopters and other heavy machinery meant for national self-defense. "We are very disappointed that a Security Council statement expressing our collective outrage at the brutal and indiscriminant tactics employed by the Syrian regime against civilians has been blocked," said Kurtis Cooper, deputy spokesman for the U.S. mission to the United Nations, after Russia vetoed the latest resolution. "These barrel bombs -- and the explosive materials contained within them -- further underscore the brutality of the Assad regime and the lengths they will go to attack and kill their own people," he added. The Russian veto came hours after Moscow seemed to take a step back from its uncompromising support of Assad. Earlier Thursday, the country’s Deputy Foreign Minister criticized statements that Assad wanted to seek another term in 2014. "Exchanging such rhetorical statements just makes the atmosphere heavier and does not make the situation calmer,” said Mikhail Bogdanov. In response, Syria’s Deputy Foreign Minister said that nobody can stop Assad from seeking re-election.